A gripping, deeply researched and important read from the Pulitzer-winning team behind The Panama Papers. From behind the scenes, a unique investigation into the crucial role that whistleblowers play –from Russian doping to Edward Snowden, Chelsea Manning, Cambridge Analytica and more– and the huge challenges they face when stepping forward. 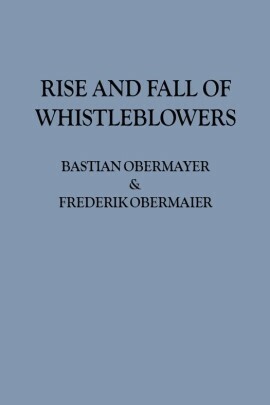 You don’t have to consider whistleblowers to be heroes, but now more than ever, they are the final safeguard of citizens at the hands of demagogues, corporations and the more opaque aspects of globalization. The acclaimed investigating team have spent time and interviewed whistlerblowers, from the famous to the anonymous, finding that while not every whistleblower puts their life on the line or acts out of charity and altruism, they all take risks. When they draw our attention to abuse of power and expose contemptible and criminal behavior, they make the world a better place.